On Saturday June 9 at 8PM SL time, a summertime tradition resumed in Second Life after a break if several months: Marianne McCann's weekly fireworks show. 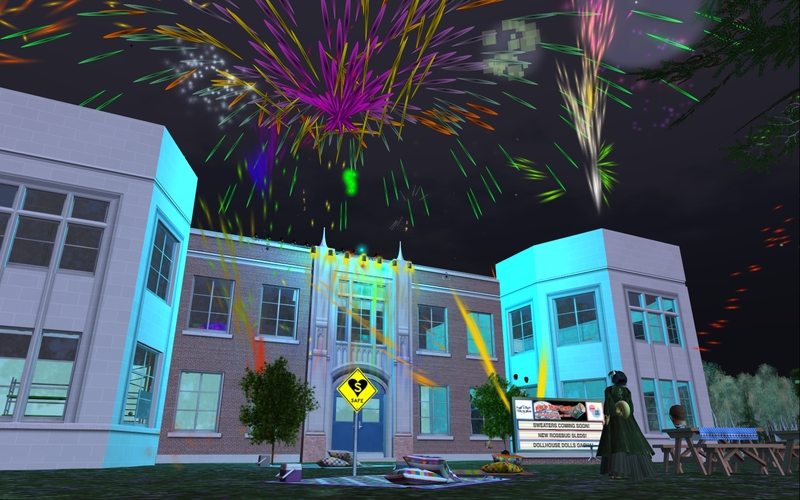 During the summertime, Marianne likes to light up a pyrotechnic display at "Kick the Can" in the Livingtree sim every Saturday. And now, it was time to begin once more. Marianne told those in her friends list the news a new moments before the show, and a number teleported over. The crowd "Ooooo"ed and "Ahhhhh"ed as the dark skies lit up and filled with color. DJ GoSpeed Racer provided the music for the event, though the sounds of the firecrackers going off could occasionally partially muffle the music. Much of the crowd came from Bay City, though Livingtree is apparently far away from it (one could be fooled just by looking at the people instead of the map). Not everything went according to plan, though. At one point some of the pyrotechnics were going off not in the air, but on the ground. And the watching crowd ended up in the muddle of the light show. Before long, GoSpeed was playing her ending theme, "Man or Astroman." And the fireworks came to a close, and least for another week. Those who missed this first show can make plans to head to Livingtree next Saturday night.